SWBAT apply the inverse relationship of addition and subtraction. Undo what can be undone! In this lesson, students will use addition to check subtraction to make sure their answer is correct. I begin this lesson by reading the story "Ten Sly Piranhas"
I would then repeat the activity with another cube train and ask students to write the subtraction sentences. Understanding why addition and subtraction are inverse relationships is the key to working with various types of problems and developing fluency in computation. The inverse relationship between addition and subtraction can make memorizing number facts easier for children. Children should understand that one operation undoes the other and that they can use addition to check their subtraction. Understanding these relationships is important for later work in algebra. For example, if 14 – 8 = 6, then 6 + 8 =14. Jane has 11 books. She gives 4 of them to Pat. How many books does Jane still have? After giving children time to solve the above problem, I would then ask them to write a related addition sentence. Since the key idea of this lesson is to get the students to relate the inverse relationship of addition and subtraction, I then write another example of a related addition and subtraction sentence on the board/chart paper. If the students correctly answered the guided practice questions, I then assign Use addition to check subtraction worksheet. These are similar problems to the guided practice problems. To extend their thinking, I will write a couple of subtraction problems on the board, and ask them to use addition to check the answers. I have them explain how to correct the incorrect sentence. 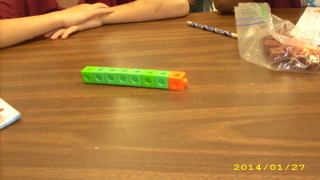 In this video, a student is using counters to model her subtraction problem. To close out the lesson, I call the students back to the carpet and have them share with a shoulder partner how we can use addition to check subtraction.